The United Kingdom will host the 2012 Olympic Games in precisely two years. In this time of austerity, the Olympic budget is a hearty £9.3 B ($14.4 billion USD), at least for the foreseeable future. What will this national investment mean to the people of the UK? What do they get for the pound spent? When David Cameron ‘s government came to power a few months ago, a program of budget cuts were immediately ushered in. After considerable wailing and gnashing of teeth subsided, MP’s thoughts turned to how this would impact Olympic preparations and whether there was any extra money floating around? Economics will play center stage to the question of the London 2012 Olympic’s legacy…what’s in it for the world? A few weeks ago, a petite article appeared in the Evening Standard jabbing David Higgins, Olympic Delivery Authority (ODA), about his budget. It seems Higgins’ “…construction budget was £500 million underspent.” The rumor is that Hugh Robertson, Shadow Minister for Sports, might pull unspent funds. If construction funds are redistributed, next year, Higgins will have to requisition money which may or may not be available. Instead, Higgins wants to circumvent this process and re-direct funds to legacy projects. Legacy is an easy word to banter about, but identifying concrete examples, the golden nuggets, is where the real legacy resides. The over-riding Olympic goal is to “change the way we build, live, work, do business and travel to help us live happy and healthy lives, within our planet’s resources.” This month, I had the pleasure to interview Terry Waite and Hugh Evans, while attending the Eisteddfod Festival in Llangollen, Wales. Open Weekend, an event that took place July 23-25 throughout the UK, is an example of how the Olympics are promoting communities to get involved, bringing people together to play, sing, contribute beyond the economies of the moment. Hugh Evans adds that the Olympics provide an opportunity and inspiration for people to develop themselves, a way to change the sports landscape. Legacy means creating a better more earth friendly way of doing things through advanced technology…change the way we build…within our planet’s resources. In June, the Suzy Guides’ team was walking along the Mall, when we spotted this unusual structure on the steps leading up to the Duke of York’s statue. Being curious, we approached Andre Ford to explain the structure. Matthew Lloyd Architects have designed a water and solar powered lift to assist handicapped people to be transported to their stadium seats. We were treated to a demonstration of how Going Green is a reality for the 2012. This is a concrete example of how the Olympics’ mandate to be environmentally friendly is actually happening. 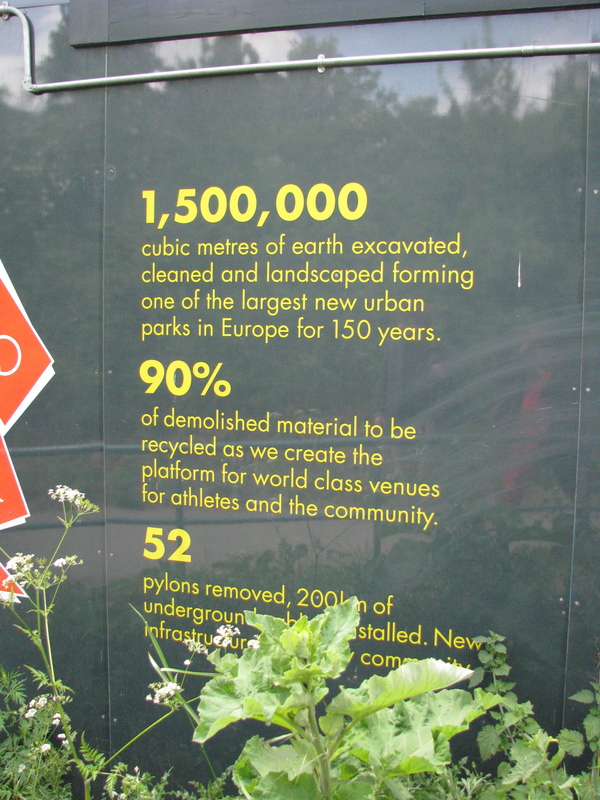 For UK citizens, their London 2012 Olympic legacy will be a renewal of the human being as a whole person both individually and through community and a plethora of inventive products that no longer pillage the earth. This is the gold medal they will hand the world at the end of the games. You might not see Beijing glitz at the opening ceremonies, but you will reap the lasting benefits of the 2012 for decades to come. 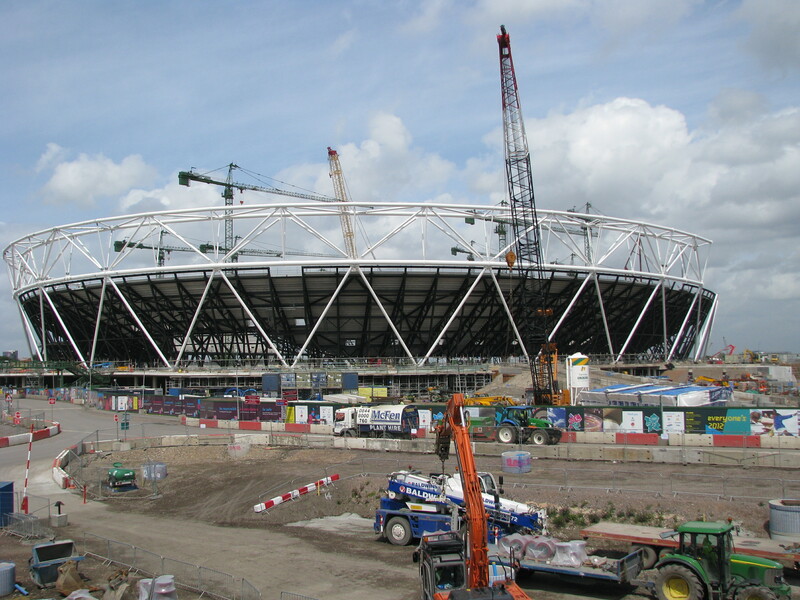 Construction on the Olympic Stadium, The Wave and the Olympic village is progressing. 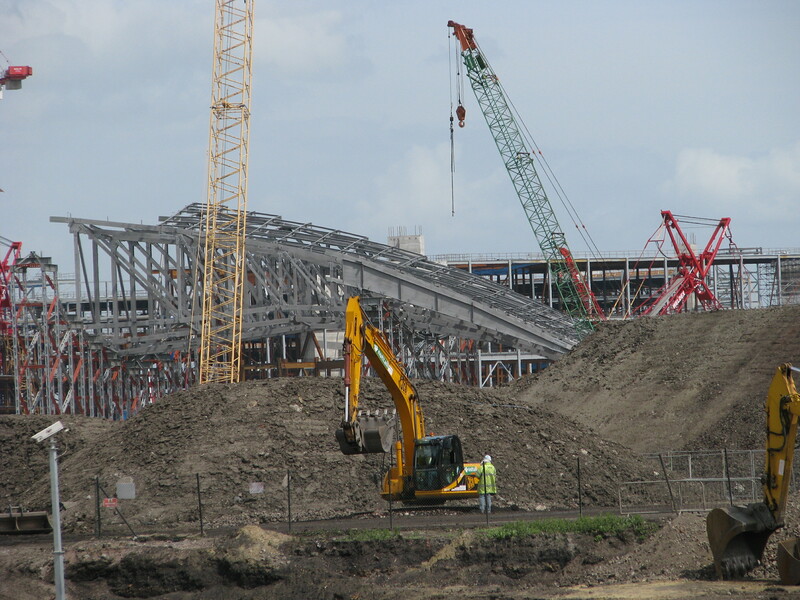 Last week the foundation for the track was being completed on the Stadium. Also, the lights have been installed. 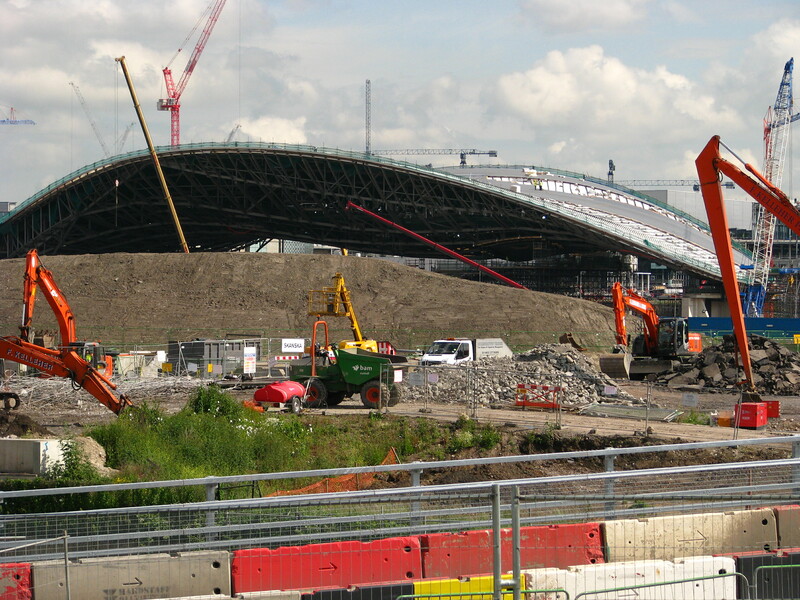 Comparison of construction progress for the London 2012 Stadium in Stratford. The Wave where the aquatic events will be held is looking like…a wave. The canals are being dredged, old structures are being replaced with new housing. Modern housing, but is it affordable? 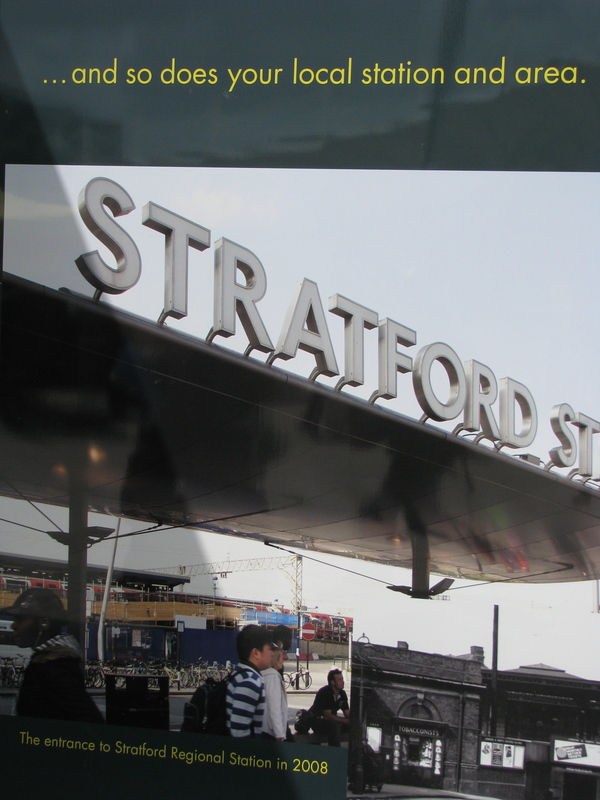 The Stratford area of London has always been a multi-cultural area and home to some of London’s poorest residents. I don’t know yet how much “affordable” housing is being constructed. But, I’m on a mission to find out the answer. When I tried to interview people working with the project (whether they had on suits or green fluorescent jackets) everyone was guarded in what they said. Just keep digging until the picture gets more focused. The change in government from Gordon Brown to David Cameron will have some impact. Not sure yet, how much spending will be cut. 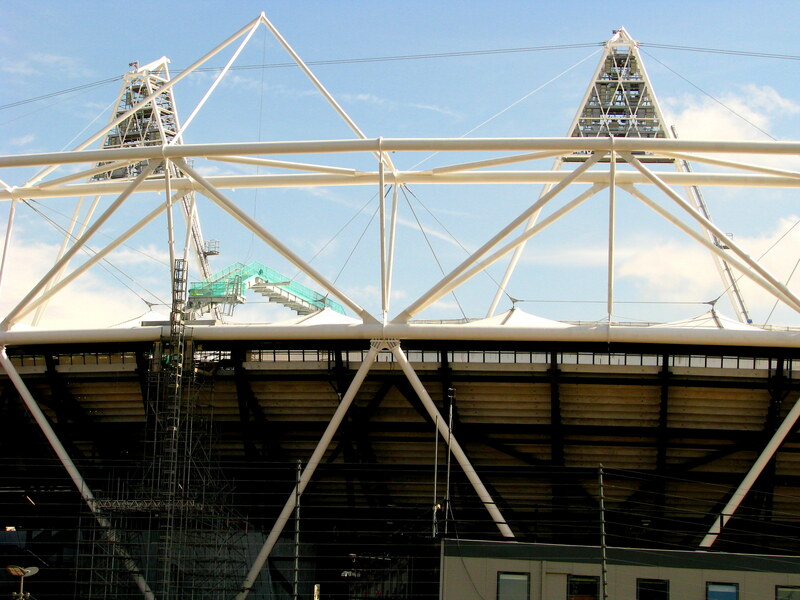 In three years, the opening ceremonies of the London 2012 Olympics will take global center stage. With a world economy on the fritz, tightening the wallets of sponsorship money, London can’t out-glitz Beijing’s 2008 extravaganza. Paul Deighton, LOCOG (London Organising Committee for the Olympic Games) Chief, explained that 2012 would initiate the idea of “inverse one-upmanship,” meaning less flash and more substance. 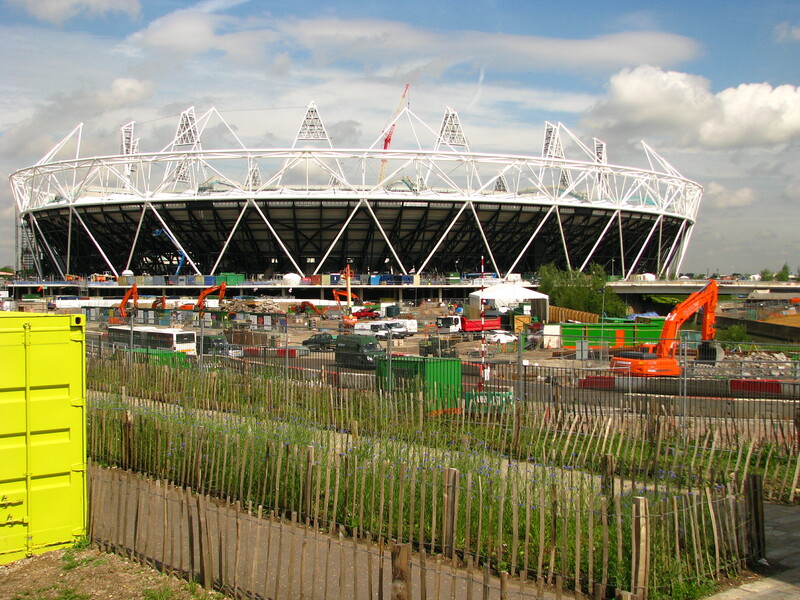 Every contract, design and decision for the London 2012 Olympics will strive to set a new British Green Standard, a continuum that stretches from eliminating wasteful packaging to practicing environmentally smart disposal to designing an environmentally friendly Olympic Flame. East London, a wasteland of underinvestment, poverty and crime, has been chosen as the site for the Olympic Park. Construction has already transformed the complexion of this predominately immigrant community. 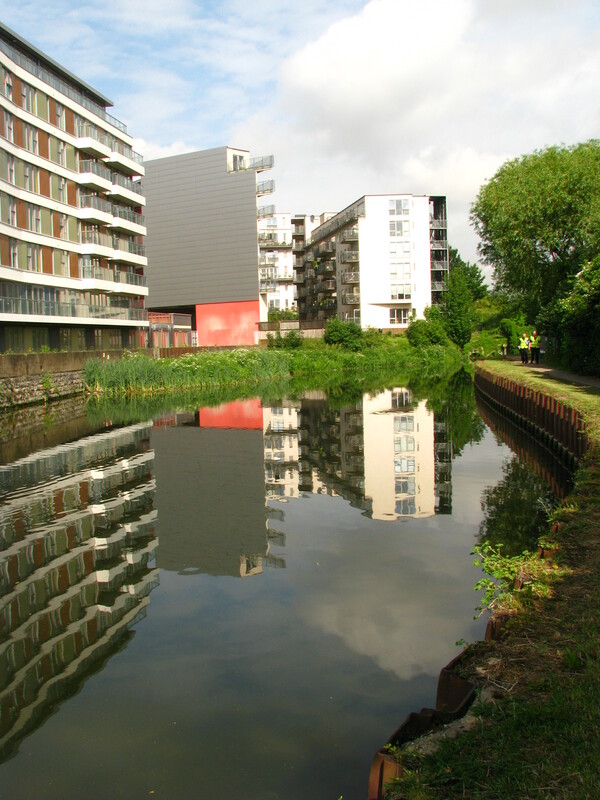 Seemingly overnight, the Lower Lea Valley has been reconnected to London for the first time in sixty years. Stratford Station, the debarkation point for the Olympic Park, has had a facelift. To facilitate people-moving, additional cars have been added to the DLR (Docklands Light Rail) and the platform extended to accommodate this expansion. Traffic from Europe will benefit from the Eurostar’s door-to-door stop at Stratford. Visitors arriving at St. Pancras Station can take advantage of a quick high-speed, 7-minute shuttle into Stratford. Efficient train service plus bus transport, bicycle and walking paths will keep car traffic out of the Olympic Park, reducing carbon emissions. Topping the list of sustainable goals is to limit waste and recycle 90% of all demolition materials. Canals that once moved WWII ammunition supplies from factories to transports have been clogged and unusable since the 1950’s. Recently, British Waterways have begun a major dredging project on the canals. Once the contaminated silt is removed, it will be washed and reused elsewhere. 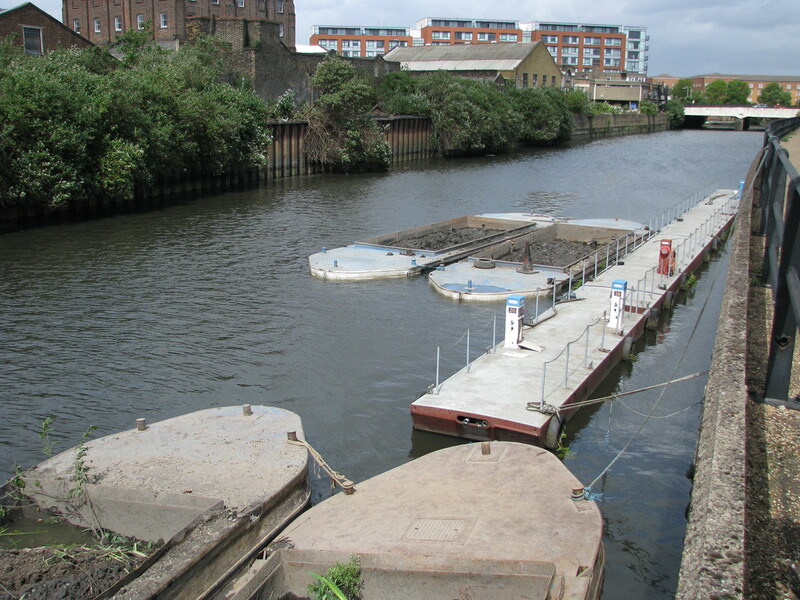 Soon, these canals will efficiently transport supplies to the Olympic facilities. Instead of bulldozing buildings to make room for the Olympic Park, these buildings have been disassembled then reconstructed on alternate sites, recycling materials and reducing waste. New housing in the form of the Athletes’ Village will be sold to the public following the closing of the games, making affordable homes available to area residents. Once completed, the Olympic Stadium will hold 80,000 visitors. At the conclusion of the games, the lightweight top section will be dismantled and the steel reused in future construction. What will remain is a 25,000-seat legacy stadium for track and field. Often, super structures define the Olympics, like Beijing’s Bird Nest Stadium. A more important legacy is how the games influence the people. The games inspire young people to set “I want to do this” sports goals. To facilitate the dreams of the youth, London is planning a new sports college, which will occupy a section of the Olympic Park. Loughborough University, one of the leading UK sports colleges, has expressed interest in operations, making this a winning team of state-of-the art facilities combined with experienced management. For the people, Olympics 2012 means jobs and business opportunities, not just for the next three years, but for a lifetime. The expertise gained from skills learned today can be taken worldwide to other events and other Olympics teaching the world eco-friendly standards developed for 2012. The London 2012 Olympics might not have all the Wow affect of Beijing, but the legacy that will emerge will be a cooperative exchange between the environment and our responsibility for environmental stewardship. London will host the 2012 Olympics. Does anyone else see the elephant in the room? China’s coming out party was the 2008 Beijing Olympics. London has the dubious honor of following this unprecedented extravaganza. Third thought: why couldn’t Paris have won? So the London Olympic powers that be, such as LOCOG (London Organising Committee for the Olympic Games), have scratched their heads to find a workable angle to avoid looking like Atlanta following Barcelona. • London can’t out-glitz Beijing. Not going to happen. Ostentatious exuberance is just not part of British fabric. To be British is to be reserved, stoic, controlled. Over the top fireworks just aren’t in keeping with British National culture. • Where-o-where has all the money gone? The £ 2 billion funding for the Organizing Committee was earmarked to come from the private sector through sponsorship, media rights and merchandise sales. But, the huge shortfall is falling in the government’s lap. Oh, bloody dear, the government is currently busy hosting their own MP EWH (economic witch hunt). Bad timing matched by bad timing. 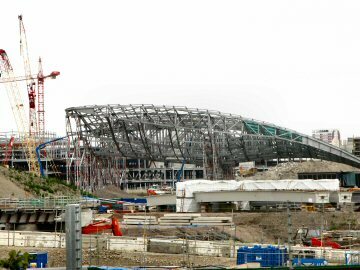 July 27th will mark “3 years to go” until the opening ceremony. I was in London last week to document progress. Construction is on schedule. The stadium is looking like a stadium. The aquatic center is coming along. Piers are planted for the Village. So, everything is hunky-dory, right? Transportation is a major, major, major issue. OK. You get the point. Huge issue. • Heathrow Airport, the tired ol’ girl, will have to carry the bulk of international visitors. When I asked Adrian Bassett of LOCOG if there were plans to expand and renovate the facilities, his facial expression said: “What’s wrong with Heathrow?” Other than BA’s terminal 5, Adrian, everything. His response was “We have four other airports around London to carry traffic.” And, how many international visitors, other than Europeans, will be arriving via Luton Airport? • The Tube is good news and bad news. The District and Circle lines are WWII vintage. In summary…worn out. Keep in mind, Stratford, the main Olympic venue, is located in far east London off the Central and DLR (Docklands Light Rail) lines. The cost for a single subway ride is excessive at £ 4.00 ($6.38). The Oyster Card provides some relief, but how will visitors know to buy it? Car traffic will be prohibited (that’s the good news). Mass transit, walking and biking are the means to get to and from the complex. Sure, I can see Mr. and Mrs. USA peddling over from Covent Gardens. What we have here is a heart attack in progress. The Heathrow Express between the airport and London Paddington is awesome and so is the cost at £ 20.00 ($31.84) one way. I almost choked. Imagine a family of four or, be conservative, a couple having a $60.00+ ride just to get to a station where they will need to spend more money to go to a hotel or an event location. Weekend Tube maintenance turns a subway ride into an X-box labyrinth game. Line after line is shut down for repair. Only the skilled find their way back home. Those without Tube Maps will be found on Monday morning wandering the halls in a starvation coma. London will give a bully good show on opening day. I am convinced. OK. I’m hopeful for the sake of our cousins across the pond. As Paul Deighton, LOCOG Chief said, “We’ll be better by being less flashy. We’ll employ ‘inverse one-upmanship’”. Paul, do you really think the world will buy that? In the face of adversity, who can pull it off better than the Brits? Winston, where are you when we need you?